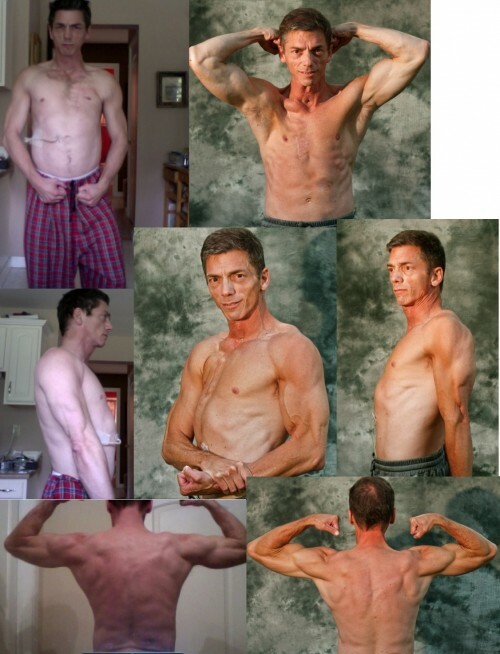 Today John talks to Lou Martinez who placed 7th in our last 12-Week Transformation contest. 1. Give us a brief history of your experience with weight training before you found us. Flash back: the early 1980’s. Farrah Fawcett was on my wall, Disco was on my turntables and in the corner of my room were dumbbells, a barbell, and a bench with a stack of clothes on it. Like many guys, I didn’t have a lot of discipline in high school, so the bench made a convenient clothes hanger. Things changed in college and in my early 20’s. Bodybuilding was the newest trend ushered in by Arnold in Pumping Iron, Stallone as Rocky, and Lou Ferrigno, as the Hulk. I started to work out seriously at Jack La Lanne /Bally’s and I even went to Gold’s and Venice Beach in California to work out where the big guys worked out. I was always skinny, so I made progress, gained muscle, and put some meat on my bones. When I was about 27 I stopped working out because I got tired of the whole gym environment. I was going through changes in my career and looking to transform myself inside as well. I had spent too many years focusing on the outside and wanted to nourish the spiritual side of me. I got married a few years later and soon after had 3 kids. With a wife and 3 kids, the gym wasn’t a priority in my life. As many of you know, I’m a two time tongue cancer survivor. It first hit me, out of the blue, in 2004, 2 months after my 40th birthday. My tumor wasn’t noticeable at first. By the time the doctors found it, it was the size of a nickel. By the time I got scheduled for surgery, it would fill my whole mouth. The tumor grew unusually fast and large. The doctors originally wanted to operate, but it became too dangerous, so they decided to do chemotherapy and radiation instead. I had stage 4 cancer and the doctors gave me a 10% survival rate. Miraculously, the therapy worked, the tumor disappeared, and I survived. My usual weight at that time was about 148. I lost at least 30 pounds if not more. I recovered quickly though because I added tons of herbs to my liquid diet (I had a feeding tube) and could eat some food by mouth. In a few months, I was back at work and in total remission. Two years later, almost to the date, the cancer came back, and they removed my tongue. While I recovered real quickly from the operation, I didn’t recover my weight. I had lost 50 pounds this time and it didn’t come back very quickly because I could no longer eat solid foods by mouth. I have been on a liquid diet, via a feeding tube, ever since. 2. Give us a brief history of your experience with dieting before you found us. With respects to dieting, I never had to diet in my whole life. As a lean guy with a fast metabolism, I could eat whatever I wanted with very little worries. My goal was always to gain weight and get bigger. As a matter of fact, losing weight was taboo for me, especially after the surgery. It took me about 2 years to gain my weight back to 145. One of the ways I did this was to go back to the gym 2 years ago. At first I was afraid to work out because of the reconstructive surgery they did in my mouth. They took my right pectoral muscle and used it as a new floor for my mouth when they removed my tongue. They also cut some nerves in my neck where they operated. I was worried to work out because I didn’t want to move things or disrupt anything. After my doctor gave me the ok, I started working out in my community gym and started seeing some real good progress. I gained my weight back and muscle too. While my chest would never be the same, I started to gain some serious muscle in other areas and looked better than I did in college when I first started working out. 3. What are your health/fitness/physique goals? One of the benefits of joining my community gym is that it isn’t very crowded. I originally stopped bodybuilding because I was so tired of that whole world. This gym was a great transition back because it allowed me to really focus on my goals which were to gain muscle and strength without any distractions. It allowed me to go at my own pace without having to look, act, or perform in a certain way. Often in gyms, goals can get lost in who benches the most or who has the biggest biceps. I didn’t have any of that there because it was mostly an older crowd with very few people. 4. How does AI compare to other programs you’ve tried in the past (if any)? When I stepped back into the gym, I did the things I used to do. I worked out 5-6 days a week, 2-3 body parts per day, and each body part twice a week. Like I said earlier, I made noticeable gains. After about a year of this, I got bored and started to look on the internet for help. I tried a few programs, but after a short while, I gave up. One of the things that bothered me was that ALL of them wanted me to have all of these rest days and only work on each body part once a week. Like a good student, I would faithfully follow each program and then realize I wasn’t gaining any muscle or getting bigger, so I would slip back into my old routines. I didn’t like rest days. Once in awhile I could see a benefit, but overall, it just kept me from growing. With the back and forth between trying different programs and doing my own thing, I really wasn’t making any new progress. I was frustrated and in a rut. 5. How did you find us? I had read some of your materials last year, but I wasn’t really interested. At that time, I didn’t think that there was any emphasis on the lower body. With a focus on the upper body alone, I wasn’t willing to sacrifice the work on my legs. I inherited a long family trait of chicken legs, so a program with no legs wasn’t the answer. But like I said, I was at a standstill and looking for something. In April, I was talking to a few guys on a website and happened to come across a post by Shan H. It had his contest pictures on it and he talked about his journey at AI. I was impressed. He was around my age, height, and he looked awesome. We started talking about his progress and he mentioned some of the philosophies of AI. One thing that struck me was our conversation on being big. We spoke about how “getting big” or reaching a certain random weight (mine was 160) was really an empty goal. What were you trying to achieve by “getting big”? This really clicked for me. It made me really look at what “big” meant, on the associations I had, and the values I placed on “being big”. Soul searching is not new for me. When Cancer rocked my world, it changed my life. Being so skinny and not being able to eat food, devastated me. Healing from cancer required more than just a physical manifestation. It required me to take a good look at my thoughts, beliefs, and actions: past, present, and future. Losing all of that weight made me feel like I was back in high school bringing all of my old insecurities with it. Shan’s questioning of what “big” meant to me, was just another road inward on my healing journey. It also sparked my curiosity and gave me an excuse to take a second look at the AI materials. 6. What made you decide to try out AI and join the contest? In May, I went back and looked on my computer because I knew I had an AI pdf somewhere. It was an intro to the Adonis Index manual. I read it and was hooked. I really wanted to get a V-taper and a six pack. I figured if it helped Shan, it could certainly help me. Yet getting the actual workouts wasn’t easy. At the time, you guys must have been revamping the website because it took me about 25 minute to actually find the website to buy the workouts. Every time I googled it, I kept getting the Adonis Index and I wanted the workouts. At first, I thought it was a sign that I shouldn’t do the program, but I prevailed and I finally got it. I joined the contest for a few reasons. I thought it would be fun, it would give me accountability, and it would help me overcome a big issue I had about my body. While the surgery was a success, it left me with a feeding tube, no pec, and slightly disfigured. I was very embarrassed and ashamed at how I looked. I never took my shirt off in public, not even in front of my kids. I wanted to heal all of the judgments I had about my body and to feel more comfortable in my own skin. I knew that posting pictures would be a challenge for me and an opportunity to let go of the shame. I was right on both accounts. 7. Explain what the experience was like going through the 12 week contest. Because I liked the philosophy, I immersed myself in the workouts and the podcasts. I really enjoyed the online community too because it was great to be able to post my thoughts, questions, and resistance!! I had been so indoctrinated in the “classic” way of seeing bodybuilding and weightlifting, that it took me some time to integrate the new way of doing things. I had to totally rearrange my mind when I got on here. For example. When so many of the guys on here started talking about losing fat to start seeing abs, I freaked out. I was thinking, “Danger, Danger, Will Robinson! Are you guys crazy! I don’t want to lose weight. I just want to see my abs. Isn’t there a ton of crunches I can do? I didn’t sign up to lose weight. I did that involuntarily a few years ago.” My weight was precious to me. I couldn’t just start losing it for abs. Needless to say, it took awhile for me to trust the program mentally. I mean, I never stopped using AI 3.1, but my mind needed time to catch up and it did. One of the things I really liked about AI was the freedom. It was great to be supported to do as many workouts as I wanted to. I didn’t have to have mandatory rest days. This was awesome to me because I already knew that my body worked well with 5-6 workouts per week. Another thing that really sold me was the simplicity when it came down to food, supplements, and calories. I tried a workout program a few months before this one that I really liked. The program emphasized form and taught you how to train with proper form to get maximum results. The problem with the program was that it was extremely supplement heavy. It also continued to indoctrinate its readers with the whole 6-7 meals, tons of protein, and to exactly time your supplements. I had to stop because it got too rigid and time consuming. When I failed to do things in this specific way, I started believing I would not get any gains. After awhile, I stopped because it was too stressful and expensive. 8. What did you think of your results? I am really happy with the results and the program. Blogging about my progress has been extremely supportive. I’ve met some really cool guys on here who have really helped me with the rough spots. I liked the workouts in AI 3.1. They were challenging and the change in reps and focus made things interesting. I was never bored. It took me a little while to get used to a program that was a bit unconventional. Most programs have the same standard workouts: bench 3-5 sets for 10-12 reps, squats 3-5 sets for 10-12 reps, etc. The different 4 week focus of each module plus the mixing up of exercises really excited me. BTW I thought the podcast about how the workouts were organized was super helpful. I really enjoy my look. I have a 4 pack for the first time since high school and I know a 6 pack is on the way. My muscles look great, I’m strong, and besides a tweak with my shoulder, things have been smooth. I was really able to work through the emotional process and issues I had with my body. As I embraced my new look and started seeing my body differently in the mirror and through my pics, I was really able to let a lot of the shame go. I could appreciate and acknowledge the progress I was making and my size and development. While this was part of my personal journey and not officially part of the program, having the AI community as another part of my already existing support system of friends and family, was an added bonus. Many of the guys could relate to what I was going through even though their situations were not the same. This built up my confidence and increased camaraderie. Like I said, posting my pics online has been really helpful. This summer I took my shirt off at the pool and even at a water park. I wasn’t self-conscious. I didn’t worry who saw my tube or what they thought. 9. What are you goals moving forward? One of the things I want to work on is my back/lats. I noticed in my pictures, it was really hard for me to get the width I wanted. My back looks cut up, but I really want that V pop. While I was watching the posing video with Eric Daye, I really liked how his Lats popped. He is my height, so I thought I’d use him as model or example. My goal is to make my back thicker and continue ripping my abs. I want to make my 4 pack a 6 pack. 10. What advice would you give to other guys who want to get in shape? Trust the workouts right away, do them, and let your mind catch up. The AI transformation is not just physical; it is a mental/emotional one as well. I like to understand everything for full buy in. Because the info on here is not the standard workout info, it took me some time to really grasp the philosophies. My advice: Listen to the podcasts. They were extremely valuable in really integrating the philosophies while I continued to do the workouts. Realize that as your body changes, it might bring up some old issues, thoughts, and habits that you might have believed your whole life. Get the support you need to deal with any emotional/ mental issues that come up to be healed. It’s all part of the process. Don’t be afraid to ask questions until you get an answer that satisfies you. Use the freedom on here to work out in ways that work for your body and your goals, even if that means to lift light or lose some weight. With that said, follow the programs as they are written. This is a tricky balance to follow. The community is awesome and the guys on here are real supportive. Use it! Have fun, be patient, and give yourself time to reach the goals you want have. Muscles don’t build over night.